On World Pancreatic Cancer Day, people around the world will unite to Demand Better in the fight against the world’s toughest cancer, starting with earlier diagnosis. On World Pancreatic Cancer Day 2017 we asked people to take action to raise awareness about pancreatic cancer, the symptoms and risks of this disease, and the urgent need for earlier detection. The fourth annual World Pancreatic Cancer Day (WPCD) took place on 16th November and was a fantastic day. The theme for World Pancreatic Cancer Day 2017 was ‘Demand Better. For Patients. For Survival’ with a focus on early diagnosis. 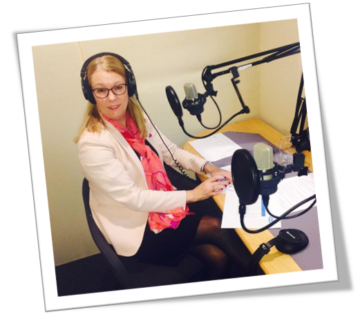 PCA CEO and founder, Ali Stunt – who is also chair of the World Pancreatic Cancer Day committee, took part in back-to-back radio interviews raising awareness and sharing the results of our new patient experience survey and explaining why the UK and the world need to demand better. Also dozens of our amazing patients and supporters bravely shared their stories in TV and radio interviews. You can look at our media highlights of the day here. We were determined to spread as much awareness today as possible, not just on social media and on the radio but face to face with the general public too. 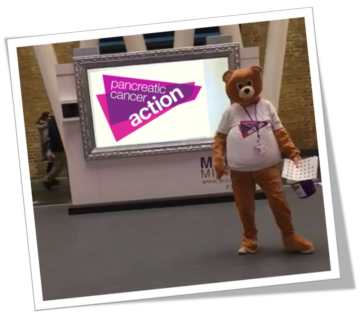 We were at Kings Cross Station in London all day with some wonderful volunteers and PCA mascott, Aware Bear, speaking to people about pancreatic cancer. On WPCD, Nick Hewer presented the last of three BBC Radio 4 Appeals. Nick spoke about his sad connection with the disease, the symptoms and stark statistics and why PCA needs support. Don’t worry if you missed it, you can listen to it here. We had some incredible national media coverage over the month including our symptoms song in The Express, The Huffington Post featured our CEO, Ali Stunt, The Daily Mail shared our symptoms of pancreatic cancer and one of our amazing supporters, Anthony Smith, was raising awareness in The Sun. Many our lovely supporters have also been sharing their story within their local press media and our lovely regional representative for Grimsby, Becky Wright, won the ‘Fundraiser of the Year 2017’ award at the Grimsby Compass Community Awards!